This looks like an interesting product for golfers who are not great on the Rules and are lucky enough to own an iPhone or iPod Touch. 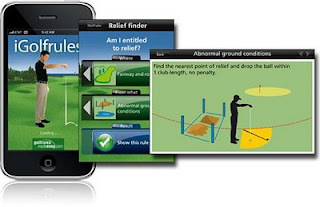 The company behind the product claim that you when you are out on the course and are not sure of a Rules situation you can click on the section which corresponds to the position of your ball, click on the headline that applies to the situation, find the correct answer/procedure within seconds thanks to more than 200 illustrations and animated slide shows, or simply use the ‘relief finder’ feature that will tell you instantly if you are entitled to free relief. At $9.99 it is not going to break the bank. I understand that it is available through the iTunes App Store. My take on it is, that it could be a very useful program for a beginner or casual golfer, to help them get a basic knowledge of the Rules, and I’m in favour of that. However, I hope that I don’t play with anyone that takes any personal digital assistant (PDA), or electronic handheld information device, onto the course in any level of competition. Apart from the very obvious problem if the phone goes off as someone starts a stroke, I think that it would be very distracting to the other players in the group if one of them kept clicking away at a device of this nature. Ringers can be turned off, and how is looking at the rules on your iPod any different from checking your golf GPS for distance - you are still checking something? If another player is that distracted by that particular action, they aren't focusing on their game at all. I carry a rule book but it would be preferable to be able to search for a word because it isn't always obvious what to search for in the index. I do respect your point of view but I am still uncomfortable with anyone taking a phone-like device onto the golf course. They may be tempted to use it for taking / receiving phone calls, which in my opinion is extremely discourteous to fellow competitors. In the next week or so (Jul/Aug 2010) I will be blogging on why, strictly speaking, it is against the Rules to take an iPhone on the course. Check out the USGA / R&A Joint Statement On Electronic Devices to see why.